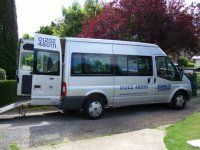 At Disabled Transport Services Ltd, based in Dorset, we have 18 years of experience in the industry, and all our drivers are vetted, licensed and fully insured. We have 8 specialist wheelchair taxis able to carry from one to three wheelchairs plus passengers. Our vehicles can also carry a mobility scooter. We operate principally in Bournemouth, Christchurch, Poole and Ferndown but can transport you to any destination, whether it's a local or long distance journey. We offer door to door transport for the users of all types of wheelchairs, including electric chairs and scooters, and for those with limited mobility. Please visit our main website, by following the link at the side of the page, for more information. Our experienced and caring drivers will ensure that you reach your destination in comfort and safety. All our vehicles are rear loading with either lifts or ramp access.